Pegi Deitz Shea's program on Refugees in Children's Books, part of the Creating a Children's Picture Book program at Arts Center East in Vernon, has been moved from tonight to Thursday, October 27th at 7:00 PM. The presentation is free and designed for parents and educators who want to discuss the refugee situation with children to increase awareness and foster empathy. 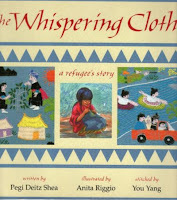 Pegi will share new children's books about refugees, discuss talking points based on research and her own visit to a refugee camp, and give out resources on the topic.